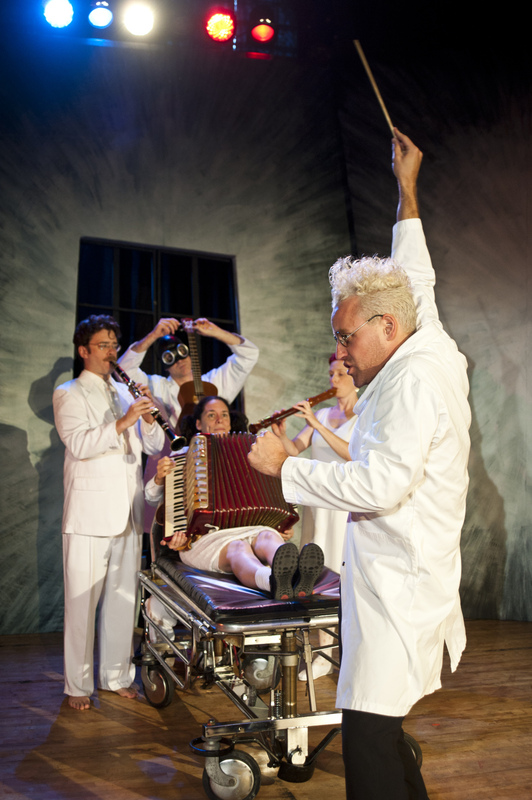 Pleasantly macabre, and musically delightful, Zuppa Theatre’s “Uncle Oscar’s Experiment” is not to be missed! I realize that be beginning of that statement is slightly an ironic, but blog reader you would be very surprised to know that this play is actually quite funny (even despite the prominent themes of death and tragedy). See Felicity Luckless is cursed… or so they say. Everywhere she goes, she brings death.. or so the believe. Felicity is placed in the care of medical maverick Dr. Oscar Smitthison-Burke (played energetically by Stewart Legere) and his strange (and adorable) manservant Gregory (Played by Ben Stone). The doctor is hopefully convinced there is a cure for Felicity’s malchance energies and will not rest until the mystery is solved. As a series of “tests” are administered things start falling apart; things start breaking, bloody procedures are performed, angels start hovering and Gregory is forced to choose between his master and his calamitous new love. Having seen the play I would absolutely recommend it! And what better time than Autumn when Halloween is just around the corner? I loved this play from start to finish. The actors’ sincere portrayal of their characters throughout the journey convinced me that these are some really creative and interesting individuals at Zuppa Theatre, and it’s easy to see that they really enjoy what they do whole heartedly. The live music and note-worthy harmonizing that accompanied the play was truly impressive, and given the intimate setting it really lent itself to a very pleasant experience. In true Zuppa fashion, the way the actors used, and moved throughout the space was very creative, and always bang on with the emotions being explored. Can we also talk about the location? How perfect to have this play performed in a beautiful (and appropriately creepy) church? I won’t spoil it anymore for you because I really don’t want to take away from the experience, but Zuppa Theatre really has some neat tricks up their sleeves this time around and so this show should not to be missed, but get your tickets fast because I hear they are selling out! EEP! Thanks so much Zuppa Theatre for having me, I really had a great time! I can’t wait to see what you come up with next!